Pictured are Gallipolis Police Patrolman Mark Still, his canine partner Gina and Gallipolis Police Chief Jeff Boyer. 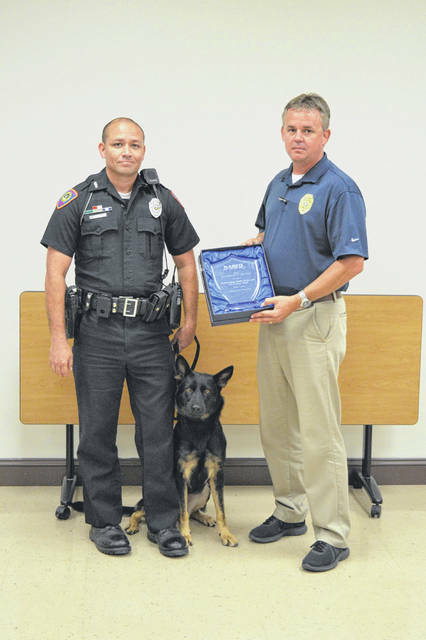 GALLIPOLIS — Gallipolis Police Patrolman Mark Still and his canine partner Gina were recently recognized as the Canine Unit of the Year by the Ohio NARCO group, a non-profit law enforcement association for Ohio’s law enforcement community. Gina was deployed 250 times during this period. Gina was credited with 20 felony narcotic case convictions and 49 misdemeanor case convictions. She and Still successfully tracked six suspects with non-bite apprehensions during the 2017 to the 2018 calendar year. Still and Gina were also deployed to apprehend two fleeing suspects in the same time period. The first was a fleeing felon wanted for murder. The second was a suspect fleeing from a motor vehicle. The individual surrendered upon being pursued by the dog and she disengaged and detained the suspect until officers took him into custody, said Boyer. Gallipolis City Commissioner Stephen Wallis said while past Gallipolis canine unit Virago was missed, they were happy to have Gina filling a much needed role for the community’s security. NARCO representatives across the state reportedly voted on the award’s recipient, with Still and Gina coming out on top, according to the Tuesday commission meeting. Statistics were submitted with each unit from across Ohio for judges to review.